FHP-Bosch water source heat pump systems are the most popular among mechanical engineers for high rise condominium applications in SW Florida. More SW Florida High Rise Condominiums were built with FHP-Bosch equipment than any other brand. 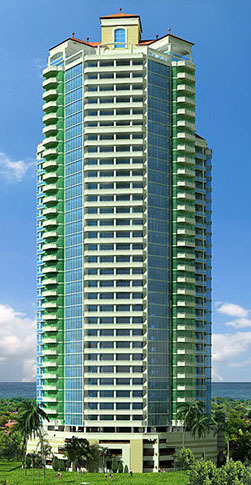 FHP-Bosch water source heat pump systems are completely self contained within your condominium. 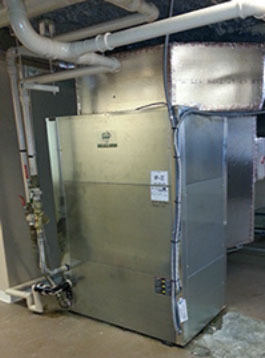 These systems are connected to a water circulation system that carries heat from your system to a common outdoor cooling tower that supplies all the systems in the building. Since there is no outdoor unit, water source heat pumps are not subject to harsh outdoor coastal conditions. FHP-Bosch systems offer uncompromising humidity control for unoccupied condominiums. Unlike conventional systems, they are not dependant upon thermostat cooling set-points to assure adequate moisture removal. User defined relative humidity set points can be maintained at any preferred temperature. These systems deliver the specified relative humidity level without over-cooling unoccupied spaces. FHP-Bosch systems are compatible for control with WiFi remote access, monitoring and control systems. Performance and humidity alerts can be used to monitor and protect unoccupied condominiums. Factory options include soft-start variable speed indoor fans and factory installed water flow valves required by many condominium associations. Many of Naples finest commercial and multifamily high rise buildings are served by Florida Heat Pump water source equipment. Available configured as split systems or single cabinet package systems from 1/2 ton to 25 ton sizes with a wide range of voltage options. 100% outside air systems bring in continuous ventilation during all seasons preconditioning and controlling indoor relative humidity levels during the hottest most humid weather periods. FHP-Bosch systems deliver unmatched humidity control capabilities to handle even the most challenging environments. Modulating dehumidification control valves deliver precise indoor temperatures and RH levels. 100% Outside Air Systems handle continuous ventilation for occupants or as make-up air for exhaust systems. FHP-Bosch Commercial Systems are custom built to meet the individual needs of each application. 100% Outside Air Systems utilize thick 6 to 8 row cooling coils that can cool 95F degree air down to 50F degrees. Geothermal Systems in Florida use ground water for transferring heat from system operation into the earth. Well water is pumped out of the ground and heated by water source air conditioning systems and then returned to the ground. 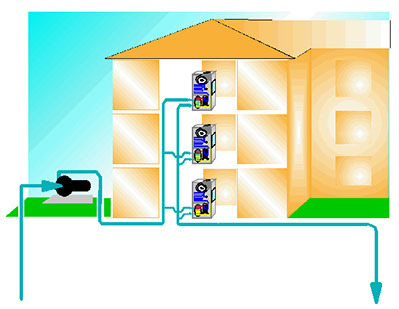 When water source heat pumps operate in heating mode, they chill the well water. The biggest obstacles for geothermal systems usually involve water quality issues that cause fouling of the heat exchangers. Filtration system and isolation heat exchangers are used in strategies to overcome fouling problems. Geothermal systems require more maintenance than other types of air conditioning systems.